This is another of those kits that is a joy to build, and makes an impressive piece on the table. The kit is a lazy painter's dream, and I am a lazy painter. 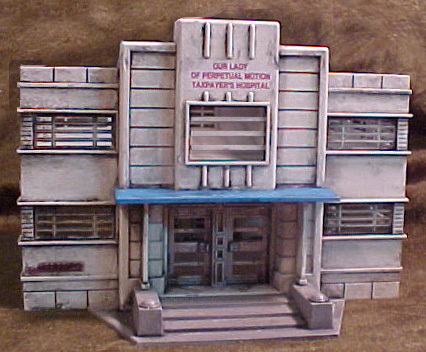 I first remoed the raised 'Plasticville Hospital' from the front above the door. 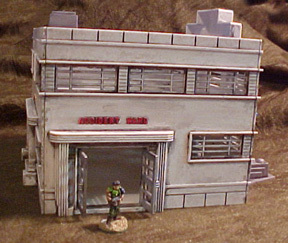 I then assembled the 4 walls, leaving off the roof, awning, steps and doors. These walls I spray-painted flat white. 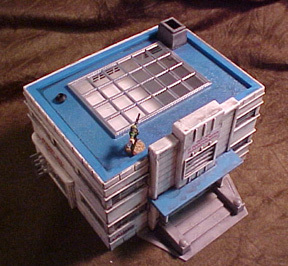 Originally, it came with a card insert for the upper floor, and a set of hospital furniture to place on it. This was neccessary because most of the roof is a skylight, allowing you to view the interior. The Roof and awning I left in their moulded blue: It's a good, opaque plastic, and as such doesn't look plasticky. I masked off the rest of the roof and sprayed the skylight frames silver. The black thing (?) was glued in place when I bought the piece. I have no idea what it is. The front steps and chimney I primed grey. 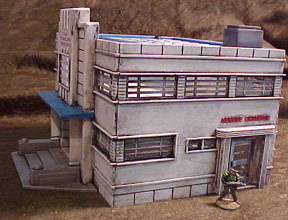 This continues an odd trend with Plasticville buildings: It always seems that when I paint them, I wind up using paint the same colours as the pre-coloured plastic. It's not intentional, it just works out that way. Before final assembly, I cut 2 intermal floors from sintra/cintra. The ground floor was needed because the doors all open above the base level, so there would be a drop inside without a floor. 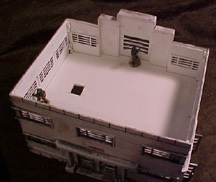 The upper floor was needed because of the skylight. No furniture, but plenty of room for figures. The building already has floor supports, so there is no need to manufacture any. The 'opening' is a finger hold so you can remove the upper floor, mine is a tight fit. There are opening doors on all 4 sides: I sprayed them silver. They snap into place, and move freely. I assembled all the pieces, leaving the upper floor and roof loose. I did the first weathering using 'Magic Wash' but the results weren't what I had intended, so I wound up using black, brown, and ochre acrylics, wiping with a damp sponge and occasioinally scrubbing with 'Fantastik'. In the end I got an effect not unlike what I had hoped for. Finally, I repainted all the signs with red paint, and added a new name to the building, printed on my computer. 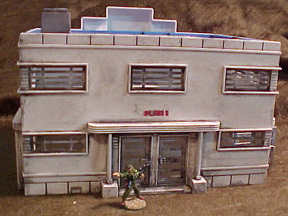 In the end, I had a building that looked pretty much the way it did when I pulled it out of the box, only grubbier.